Somebody once defined military service as interminable boredom interspersed with moments of extreme terror and a look at 37 Sqn’s story over the years suggests that its could have been summarised as such. While no one who served in 37 Sqn could possibly have suffered from the former there may be a few, even now, who would own up to the latter. While the experiences of 37 Squadron are certainly not unique its history seems to be one of extremes. 37 Squadron Royal Flying Corps first saw light of day on 15 April 1916 as part of an experimental unit based in Orfordness. It lasted precisely one month! It reformed later that year flying home defence sorties based at various landing grounds in the south-east. The night of 16/17 June 1917 was to see 37 bring off one of few night successes when Lt. Watkins, flying a Be2 brought down Zeppelin L48. Following the end of hostilities it ended its early incarnation in July 1919 then flying Sopwith Snipes from Biggin Hill. 37 re-formed as a bomber squadron in April 1937 flying Handley-Page Harrows but before the declaration of WW2 had converted to Wellingtons and within seven hours (!) found itself faced with the realities of total war. Yet it was to be the first of 37’s boring experiences in that six aircraft took off to attack German shipping around Heligoland. It was meant to show that Britain was ready and equipped to bring the war to the enemy and in daylight, but by the time the aircraft reached the target area darkness was already falling and the weather was closing in and all aircraft returned with their bombloads intact. There was soon to be a very different experience. Volume 1 of ‘Aircraft of the Fighting Powers’ of 1940 reports “…….raids were carried out by Wellingtons in the months that followed, during which time their fine defensive power was proved in many engagements with fighters”. Reality was to be deadly. Whether the Germans had already assessed the aircraft’s weakness is unclear but with the same brief as before, on 18 December, a force of 22 Wellingtons, including six from 37 Squadron, took off. Approaching the enemy coast they were attacked by both Me109 and Me110 fighters. The Wellington did indeed have fine defensive power by the standards of the day but only in the nose and tail and didn’t include any beam guns. Five of the six Squadron aircraft did not return. By the end of the year 37 Squadron had been transferred to the Middle East where its life of highs and lows was to continue. At the outset, 37 Sqn was based at Shallufa in Egypt but one of its major targets was heavily-defended Benghazi where the axis had large supply dumps. It represented a range of almost 1000 miles and a total flying time of around 10 hours. This demanded not only re-fuelling at an Advanced Landing Ground but, in anticipation of later Shackleton operations, an augmented aircrew with two pilots, two wireless operators who also doubled up with the two air-gunners. Presumably similar crewing was necessary when flying eastwards into Iraq. Evolving out of the British Mandate in ‘Mesopotamia’ Iraq became an independent realm supported by Britain, not the least because of oil, and two air-bases were maintained, one being Habbaniya NW or Baghdad. With axis encouragement a coup d’etat toppled the monarchy, Habbaniya was attacked by the ‘rebels’ and 37 Sqn was called upon to provide air support. Although the RAF’s defending forces were meagre in the extreme Habbaniya survived and despite the Wellington’s lack of defensive armament the Sqn even succeeded in downing a rebel Hawker Nisr! This was no picnic but compared with what was to come it probably rated as one of the quiet periods. 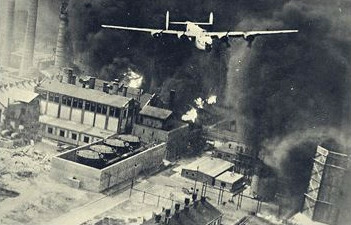 In common with most of the desert air-force 37 Sqn followed the advance into Italy and found themselves sharing Tortorella airfield with elements of the American 15th Air Force which, in the middle of 1943 had attacked the Ploesti Oil Refinery in Rumania. Churchill had dubbed Ploesti ‘the tap of the axis war effort’ and it was defended as such. Of the 177 Liberators which took off on that occasion only 33 returned and it remains the greatest loss in the history of the USAF. Ploesti had been attacked a further 14 times by August 1944 and the two air-forces were sharing Tortorella, but this time 37’s Wellingtons were to be included in the latest raid. It is easy to imagine the crews’ anxieties at the prospect of attacking so heavily defended a target and it was probably one of 37 Sqn’s greatest periods of intense terror. As WW2 neared its conclusion 37 Sqn finally converted to B-24 Liberators and was still based at Tortorella but the Liberators were soon to be returned. 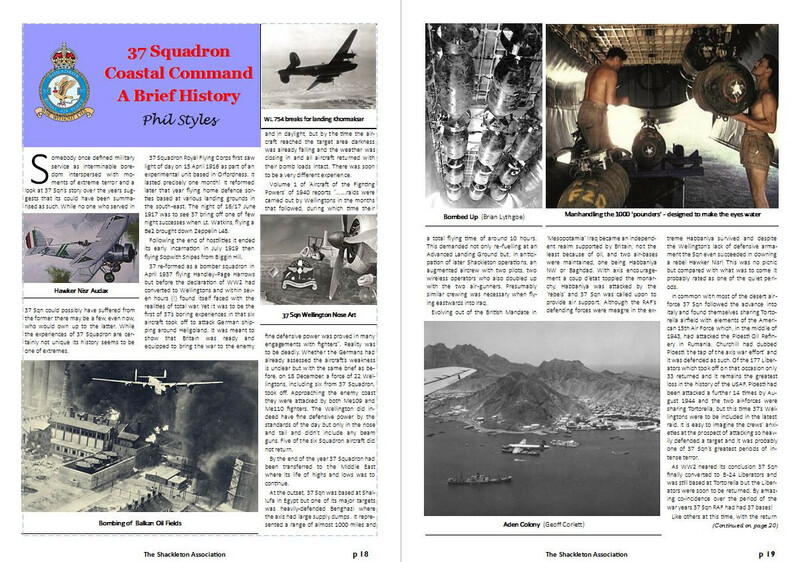 By amazing co-incidence over the period of the war years 37 Sqn RAF had had 37 bases! Like others at this time, with the return of its Liberators, 37 became a maritime reconnaissance squadron equipped with Lancasters and moved to Palestine to see out the British Mandate before withdrawing in May 1948 to Luqa in Malta where, in July 1953 it was to receive its MR2 Shackletons. 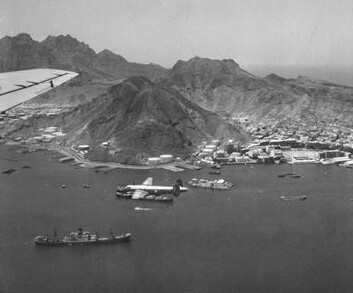 There then followed four years of routine Coastal Command duties until someone decided that some real bombers were needed to help settle the ‘rebel tribesmen’ in Aden. 37 Sqn moved to RAF Khormaksar in August 1957. Despite the apparent inequality of the forces and the relative might of the Shackleton this was once again to prove to be ‘no picnic’. 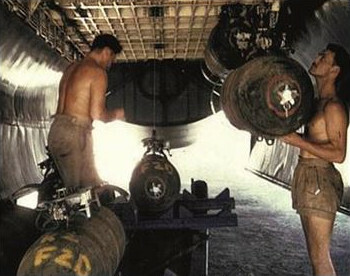 Temperatures were intense and bullet holes were commonly found in the aircraft following low level attacks. 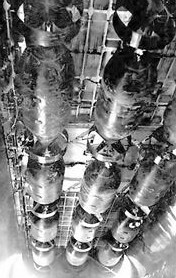 More disturbingly, it was found that the pilot of a downed Beaver which 37 had been detailed to locate had been summarily executed. The crews of 37 Squadron could expect no better. But by now politicians had decreed that there would be no further British military presence ‘east of Suez’ and the squadron finally disbanded after 10 years in Khormaksar on 5 September 1967.